This weekend, I traveled to Dallas, Texas for a music industry conference. I had never been to a conference as an entertainment industry professional but over the summer a good friend mentioned he'd be attending this one and I figured I might as well make the trip. I had a flight credit so the only costs I would have to worry about were a hotel, food, and transportation around the city. To be honest, I was nervous before this conference began; I didn't know what to expect and I didn't know if I'd feel like I fit in. I've been involved in the music industry in various capacities for seven years now but it's only as of this past week that I've been able to say I work full-time in music. Would everyone there be more accomplished than me? Would everyone know everyone else? I really only knew one person attending the conference, but I figured these events were the perfect opportunity to meet new people, so I booked my flight. When I landed in Dallas on Friday afternoon, I met up with a new friend for lunch, and we immediately hit it off. I caught up on work for a few hours and spent some time listening to new music. As I sat on my hotel bed (a gorgeous, comfortable king bed with a view of the city) hearing these songs for the first time, any hesitations I'd had about the weekend's events were erased. I've been so in love with music for so long and I finally feel like I'm coming in to my own. I walked in to the mixer with my head held high and found myself meeting new people with ease. On Saturday I joined a few new friends for brunch before heading over to the panels. I found myself learning a lot from what everyone had to say but I think my biggest takeaway is how varied everyone's experiences were. It was proof that there really is no one way to "make it" in the music industry. I was able to see my work in print for the first time and show that to others that were in attendance. That night I headed to my first Emo Nite and while I was nervous to walk in alone, that ended up being the best decision I could've made, and even though the room was full of strangers I was so sure of myself in the moment that I loved everyone there. I danced and I screamed along to some of my favorite songs and I talked with friends and knew the trip was worth it. When I woke up on Sunday, my plan was to have breakfast with an old college friend before heading to the post-conference brunch to socialize, then hit the road with my good friend to head to Houston for a basketball game. Breakfast and brunch happened as planned but my friend and I never made it to Houston. The day was not to be wasted and as friends do, we had an adventure of our own in exploring rural Texas before heading back to Dallas for dinner. 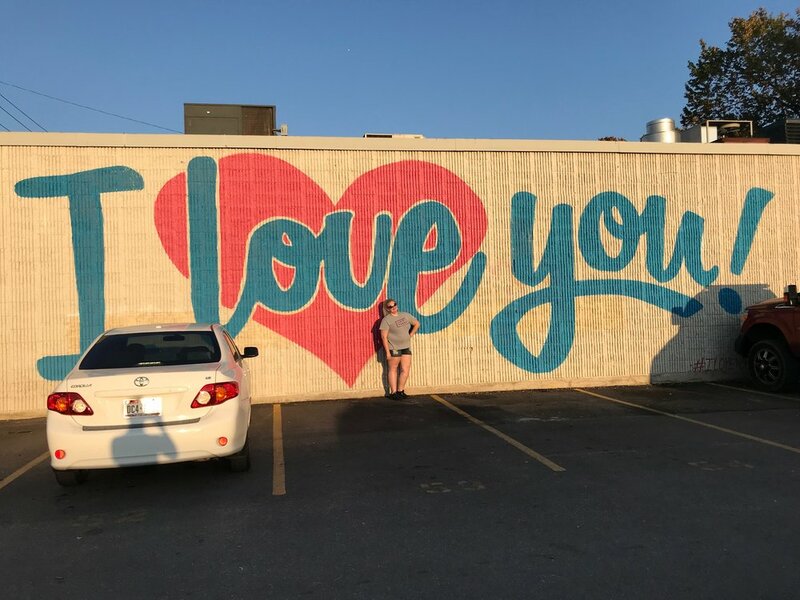 The day was as much about the things we saw and the tacos we ate as the conversations we had, and when we walked around Deep Ellum that evening I realized I'd had a day full of perfect moments. I'd spent the entire day in such good company and found myself feeling so grateful for the people I was able to surround myself with. More than once over the weekend I was thanked for being friendly, and another time I was complimented on my confidence. I received plenty of compliments on my work which made me incredibly proud, but it's the compliments about who I am that have stuck with me the most. It's important to me to be a good friend and I put a lot of effort in to my friendships, both new and old; this effort isn't always noticed and isn't always reciprocated and to know that people actually do pay attention means more than I could say. My travels home on Monday involved two flights. My second flight was delayed and the airport I was in did not have functioning Wi-Fi, so after grabbing lunch I spent the day reflecting on my trip. On a professional level the trip was absolutely worth it but what I'll remember most is the people. For a long time I thought my career mattered more than anything else in my life and thought myself a bit of a martyr for putting that before my relationships. If I've learned anything this year though it's that that way of life is actually pretty stupid, and to be honest, I need people. My career is incredibly important to me and always will be, but what is life if there's no one to laugh, cry, sing along to your favorite songs, or make new memories with? There's nothing like spending an entire weekend in good company, and my trip to Dallas was spent with some of the best.